NRA Receives Millions from Gun Industry "Corporate Partners"
The National Rifle Association (NRA) receives millions of dollars directly from domestic and foreign gun manufacturers and other members of the firearms industry through an organized corporate outreach program, according to a new report issued today by my organization, the Violence Policy Center. Total donations to the NRA from all "corporate partners" -- both gun industry and non-gun industry -- for the same time period total between $19.8 million and $52.6 million. The vast majority of funds -- 74 percent -- contributed to the NRA from "corporate partners" come from members of the firearms industry: companies involved in the manufacture or sale of firearms or shooting-related products. There's also a companion YouTube video with the report. Despite the NRA's historical claims that it is not financially allied with the gun industry, including the current disclaimer on its website that it "is not affiliated with any firearm or ammunition manufacturers or with any businesses that deal in guns and ammunition," NRA "corporate partners" include many of the world's best known gunmakers as well as such companies as Xe, the new name of the now infamous Blackwater Worldwide -- known for its abuses in the Iraq war -- which alone contributed between $500,000 and $999,999 to the NRA since 2005. In a recent promotional brochure, NRA Executive Vice President Wayne LaPierre promises that the "National Rifle Association's newly expanded Corporate Partners Program is an opportunity for corporations to partner with the NRA... This program is geared toward your company's corporate interests." Having directors who intimately understand and work in leadership positions within the firearms industry ensures the NRA's focus is honed on the overall mission of the organization. These individuals bring a keen sense of the industry and of the bigger fight to the table. Among the NRA's "corporate partners" who gave $25,000 or more to the organization are 22 that manufacture firearms, including such well-known gunmakers as: Arsenal, Inc.; Benelli; Beretta USA Corporation; Browning; DPMS Panther Arms; FNH USA; Glock, Inc.; H&R 1871, LLC; Marlin Firearms; Remington Arms Co., Inc.; SIGARMS, Inc.; Smith & Wesson Corporation; Springfield Armory; and, Sturm, Ruger & Co., Inc.
Of the 22 gunmakers, 12 manufacture assault weapons. 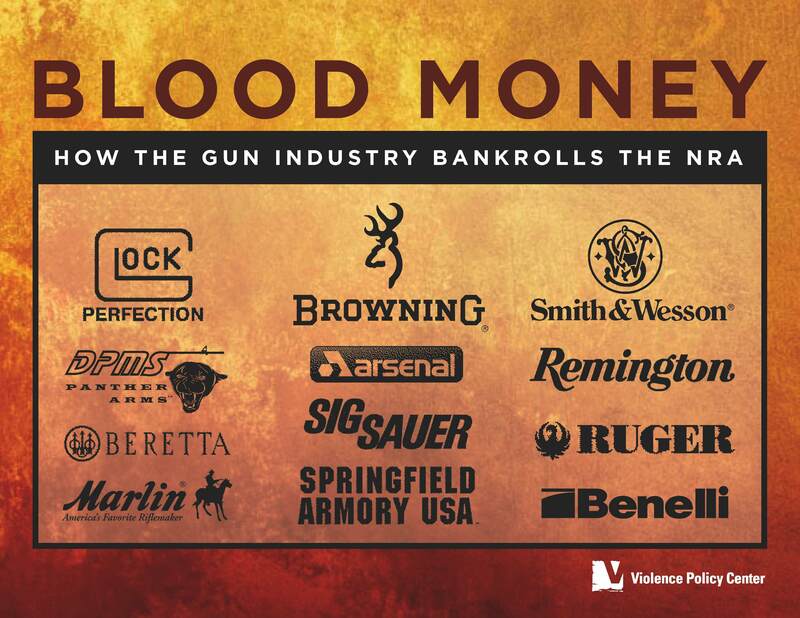 Also among the NRA's "corporate partners" are numerous high-capacity ammunition magazine manufacturers or vendors. One manufacturer, Beretta, donated one million dollars to the NRA to work to overturn gun control laws in the wake of the 2008 U.S. Supreme Court decision in District of Columbia v. Heller (which for the first time ever recognized an individual right to possess a handgun in the home for self-defense). By 1987, we were doing about $5 million in business, selling mostly to dealers. The product lines were bulk components and cartridge boxes. The Volkmer-McClure law was enacted in October 1987, which removed the restriction of shipping brass and bullets to FFL holders only. Midway immediately began selling directly to consumers, in addition to selling to dealers. In January 2011 the company announced that for "a second consecutive year" it was serving as "the Official Sponsor of the NRA Annual Meeting and Exhibits..." being held in Pittsburgh, Pennsylvania later this month. One Pittsburgh resident who apparently took part in the NRA's Round-Up Program through MidwayUSA was concealed carry permit holder George Sodini, who in August 2009 opened fire at an LA Fitness Center in Collier, PA, killing three women and wounding nine others before turning the gun on himself and taking his own life. A copy of the e-mail receipt sent to Sodini from MidwayUSA for his purchase of 9mm and .45 ammunition that was shipped to him courtesy of McClure-Volker includes a donation of 74 cents from the mass shooter to the NRA via the Round-Up Program. The NRA claims that its positions are driven solely by a concern for the interests of gun owners, never mentioning its own financial stake in protecting the profits of its gun industry patrons. The mutually dependent nature of the National Rifle Association and the gun industry presents a new context -- dollars and cents -- in understanding the NRA's unwillingness to compromise on even the most limited controls over firearms or related products (such as restrictions on high-capacity ammunition magazines). At the 2009 Conservative Political Action Conference (CPAC), NRA Executive Vice President Wayne LaPierre told a cheering crowd that "the guys with the guns make the rules." The information contained in the VPC's new report raises the question as to what degree it is the guys who make the guns who make the rules.